Margaret Cartner did not arrive in a horse and wagon dressed in gingham, but she is nonetheless a true pioneer. She and husband Sam own and operate Cartner Christmas Tree Farm in Avery County. Through her decades of affiliation with tree growing, she has witnessed tremendous growth in the North Carolina production of real Christmas trees–from small size yard plantings to the mega-scale diversified plantations many growers operate today. Born to a farm family in Macon County, NC, Margaret has long had the rich fertile soil of the western North Carolina mountains in her blood. Completing her college work, she began a job as Assistant Home Extension Agent with 4-H clubs in Haywood County. While interviewing for that first job, she met her future husband. Sam was then working in Madison County with Extension and TVA projects. Later Sam transferred to Ashe County and continued to work with Extension. The long-distance courtship culminated in marriage in 1948 and in 1949 Sam transferred as Extension Director in Avery County, which they made home ever since. Margaret and Sam are the parents of three sons–David, Jim, and Sammy. The youths were encouraged to continue their education and explore different options in addition to what they learned at home. David and Ginny live in Asheville, Jim and Jane in Statesville, and Sammy in Birmingham. There are eight grandchildren and one great-grandchild born this January. Even though there is some distance, each of the families feels they are only a phone call away. They readily come when the need arises to lend a hand. The family is supportive of all the farm efforts and Margaret feels that they could not have continued without this support. Through the boys’ membership in 4-H and FFA and their love of farm projects, Sam acquired first-hand knowledge of practices to pass on to others. He realized that the Agricultural Extension program was a challenge and much more effective by correlating the technical knowledge with practical experiences. Sam arranged for any interested farmers and nurserymen to meet and discuss the possibilities of a state Christmas tree organization. A charter was drawn up, signed, and submitted to the state on August 8, 1959. The charter was approved — thus the beginning of the NCCTA. As with many women at that time, Margaret feels that her early role was to rear the boys and keep the home fires burning since Sam was often away with meetings or summer camps. She has worked outside the home to help financially as the family built the business but she has always perceived her role as a helpmate to Sam, who was the primary breadwinner. Those of us who know her realize that this is her characteristically modest self-appraisal. 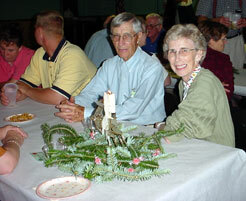 Long active in Newland Presbyterian Church, retired school personnel associations, and other community interests groups, Margaret feels that she and Sam were richly blessed to have the opportunity to host the Summer Farm Tour for the NCTA convention hosted by NCCTA in Asheville in 1998. She gives credit to then president Harry Yates and his national planning committees for the hard work and planning they did. Margaret worked with the banquet committee and their planning and careful attention to detail was evident, such as the choice of crystal water glasses etched with Christmas trees. These glasses were given as mementos for those attending the banquet. Some of the glasses had been broken in shipment and Margaret handled the last-minute crisis and located replacements to meet the demand. The farm tour at the Cartner farm was well organized and a great example of “warm” Southern hospitality. She insists that everyone worked as a team to organize the Convention and reminds us that it is much like the cooperation needed to run a successful farm. Many who attended that National Convention declared it one of the best they have ever attended. Margaret reflects on the early years of tree farming when growers had to endure long hours of arduous physical labor with limited crude equipment and almost no researched farming methods because of a lack of any collective data from which to draw. Margaret gives high praise to the efforts of the Extension Service and NCSU for all the work done in research. Great contributions have been made over the years in every aspect of tree farming–from better equipment, on-site technical advice from plant pathologists, new data on insect control and soil use, to planting procedures. She feels that tree growing remains a stressful, risky, laborious, and costly venture because each season’s harvest is in jeopardy due to many variables beyond the control of the grower. For the business to be viable, the entire family needs a great deal of dedication and commitment. She is encouraged for the future of the industry when she sees many of the same young people who grew up spreading fertilizer and dragging spray hoses now continuing in the second and third generation on their family farms. Presently, Margaret works full time in the family farm business after having retired in 1989 with 33 years in the Avery County School System. Of her teaching years Margaret states, “These were wonderful years and I loved being with the students and fellow teachers. Many students, now adults with families of their own, are great friends and outstanding citizens throughout Avery County and elsewhere.” While Margaret and Sam do not have a strict division of labor in their farm operations, Margaret admits that she has never worn a back pack and she primarily looks after the mail order and Choose & Cut operations as Sam devotes himself to their wholesale business. Margaret and son David have computerized their business and Margaret takes care of payroll, bookkeeping, taxes, employee Social Security, etc. She also keeps up with the H2A migrant labor regulations for their nonlocal employees. One example of her dedication to the health and well being of her employees reflects the type of care and concern that is characteristic of her and the business. Margaret accompanied one of their migrant families to an Asheville hospital when there were problems with a pregnancy. When the mother suffered a miscarriage, Margaret remained overnight with her, making arrangements for an interpreter, a priest, grief counseling, and later arranged for a burial site and funeral funds. She sees all of this as merely responsibility to her “farm family” and as what anyone would do in the same situation. Margaret Cartner serves as an inspiration to many but she takes little credit for her successes. Citing hard work and family commitment, she feels that “working together ” is the only way to achieve success in the tree business and she feel it should be the slogan for our industry. No, Margaret did not come here in a Conestoga wagon but this woman has much to share for those who follow as tree growers. We are indeed indebted to Margaret and Sam for their many contributions and for their commitment to the industry.